Last year, I posted a photo of the Lucky Fortune Cookery that heavily emphasized photographic perspective, looking upward for a very enhanced execution of leading lines. Well, that was during the daytime. This time, I wanted a nighttime version, but rather than only shoot the roof structure (which was really done to avoid capturing the people that would be at the ground level of any daytime frame of this scene), I was able to shoot the entire queue for the quick serve area. The colorful lanterns and neon lights make this pretty much an possible shot to truly accurately capture within one exposure, so I took three different exposures--one exposed 2 stops over and one exposed two stops under to go with the properly exposed photo--then manually blended them together in Photoshop to produce a more even and realistic composition. I used to do this via Photomatix, but ever since I started shooting on my Nikon D600, I've shied away from that, preferring to more directly control how my exposures come together instead. I'd like to think that this came out pretty well. What do you think? 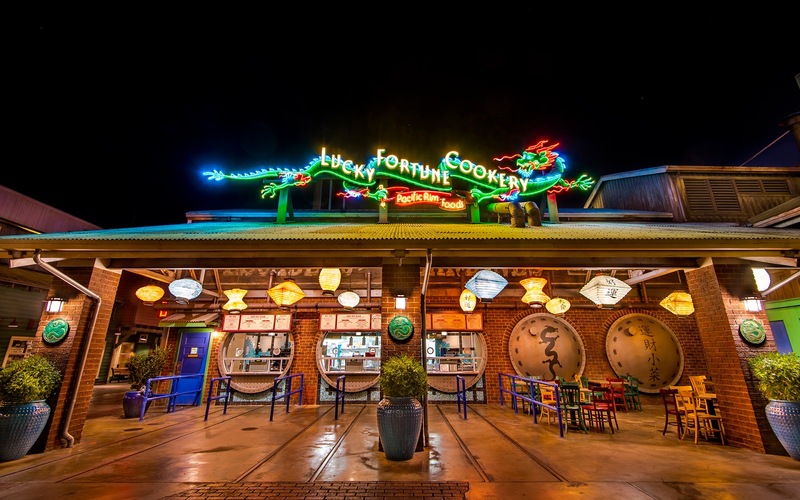 A very architectural nighttime shot of the Lucky Fortune Cookery at Pacific Wharf.